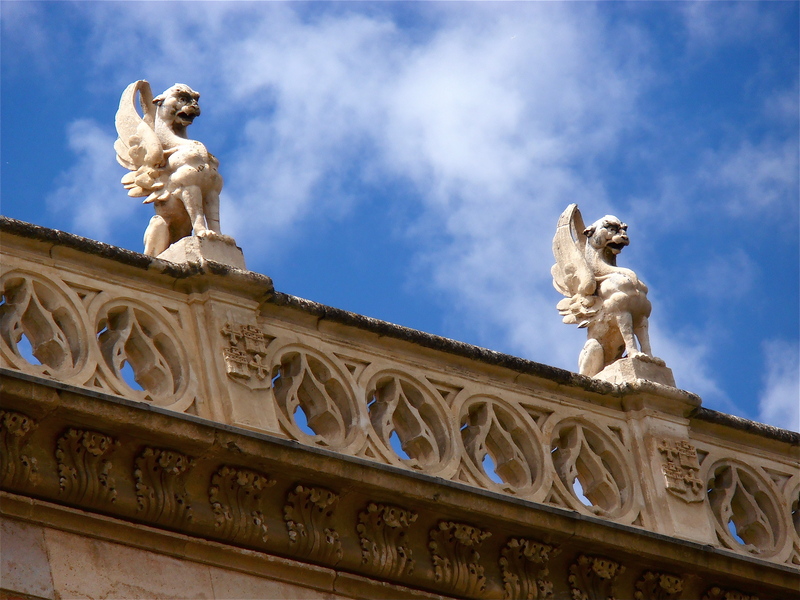 Cee’s Fun Photo Challenge for this week is themed Statues, Carvings, Sculptures. 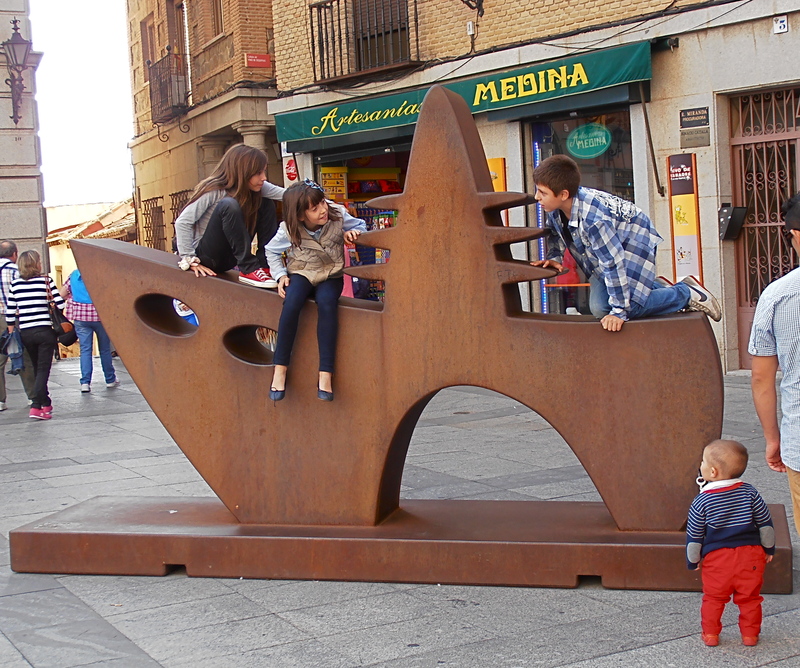 My contribution is a couple of traditional statues from odd angles, and a modern one. 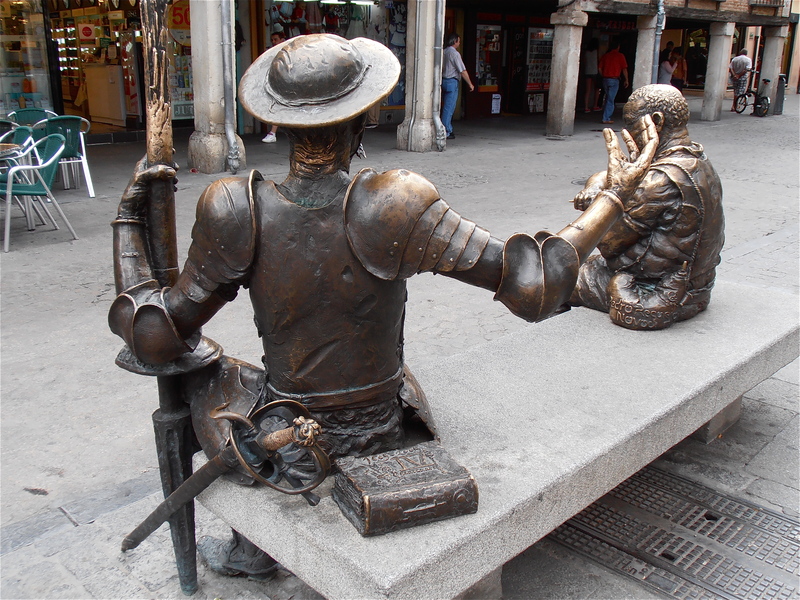 Statue in Toledo outside the Alcázar (fortification), taken on Wednesday. Amazingly blue sky that day! This entry was posted in Photo Challenge and tagged Álcala De Henares, Photo Challenges, Toledo on October 12, 2013 by ladyofthecakes. 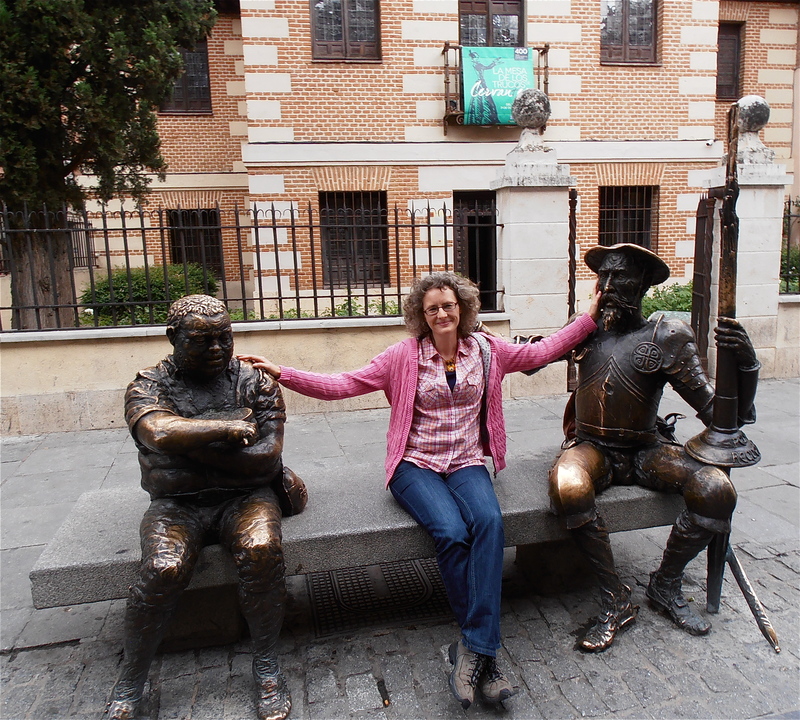 We’re back once more in the town of Alcalá de Henares, where Cervantes was born, and where our two compañeros DonQ and SanchoP not only lay claim to their own bench for resting their weary bones, but they’ve also taken possession of an entire wall! 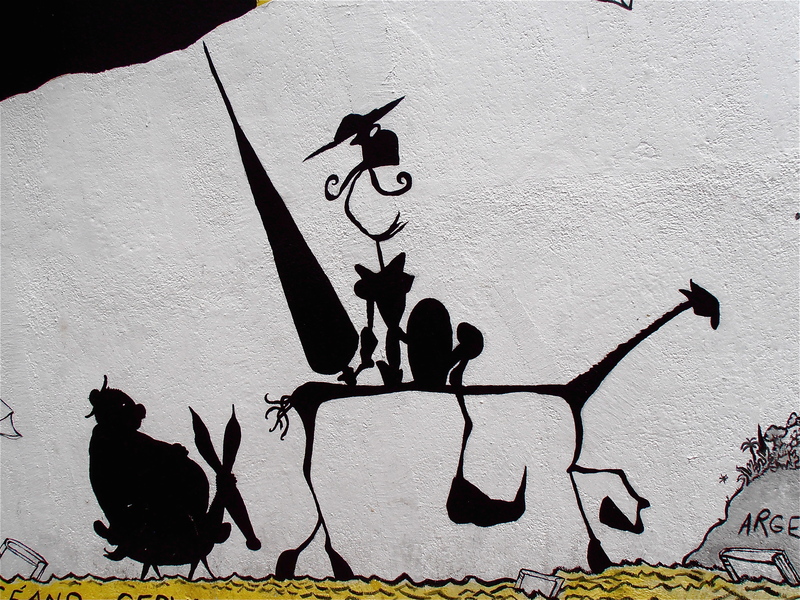 For the other posts in the Weekly Don Quixote series, click here. 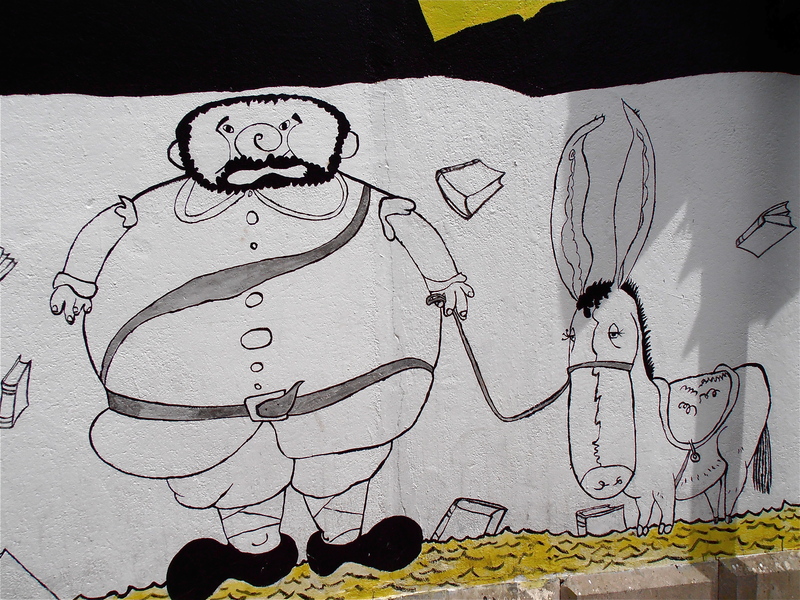 This entry was posted in Don Quixote and tagged Álcala De Henares, Don Quixote on July 3, 2013 by ladyofthecakes. 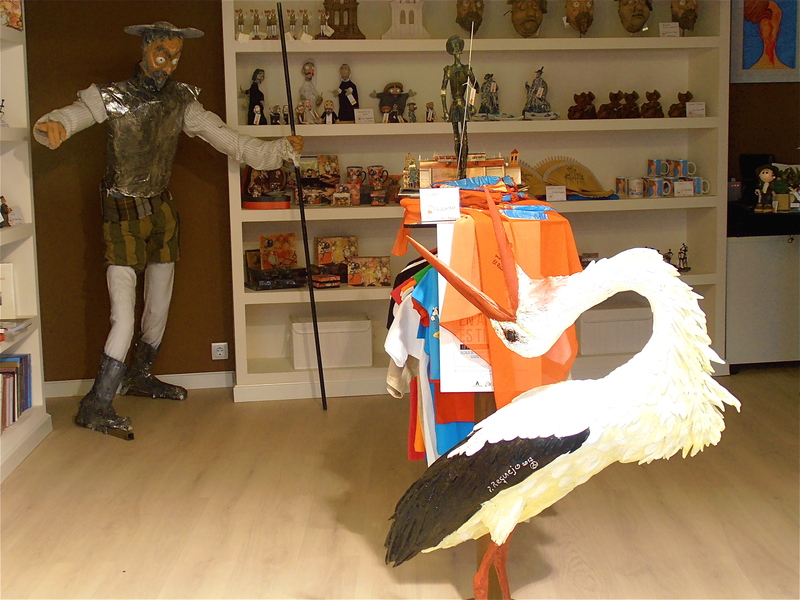 The Weekly Don Quixote: Heinous Slayer of Storks! 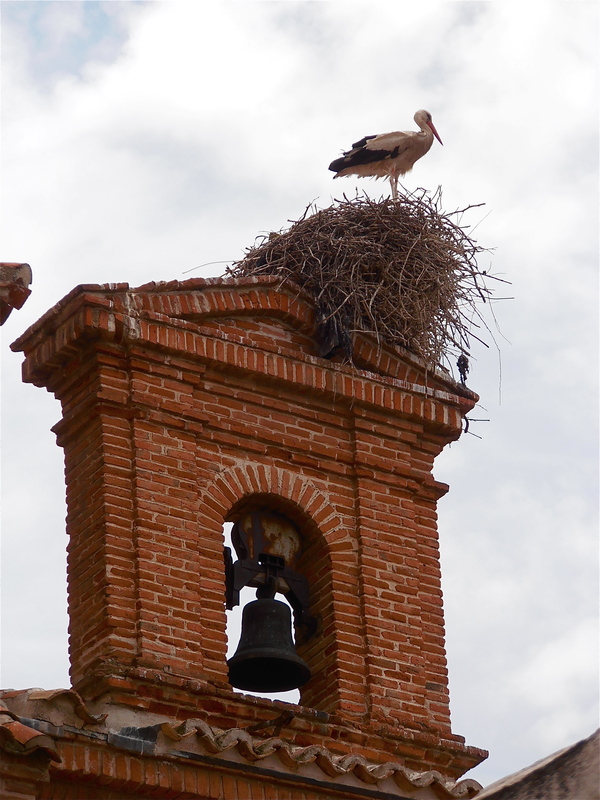 On my recent visit to Alcalá de Henares, aka Stork Central (see this post from a couple of days ago), I made a rather distressing discovery: Don Q is not in the least bit favourably disposed towards storks. Irrefutable, isn’t it? That poor bird is toast. I think I need my smelling salts. A ghastly revelation this may be, but I plead with you to remember that this is the valorous Don Quixote we’re talking about. He needs our help to overcome his stork aversion disorder that blights his otherwise impeccably honourable character. I suggest we all club together to buy him a lifetime membership for the SSA (Stork Spearers Anonymous). 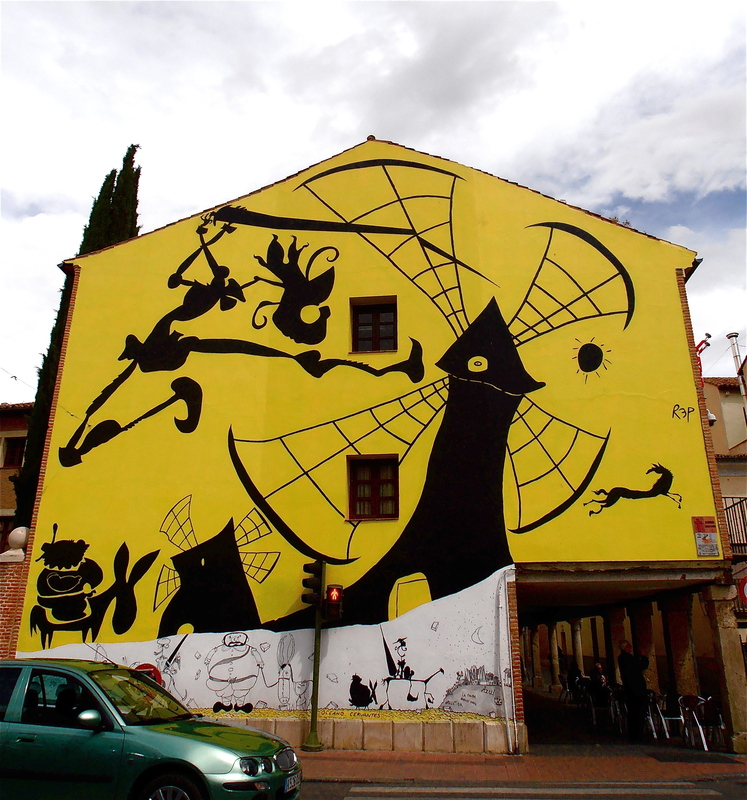 This entry was posted in Don Quixote and tagged Álcala De Henares, Don Quixote on June 25, 2013 by ladyofthecakes. 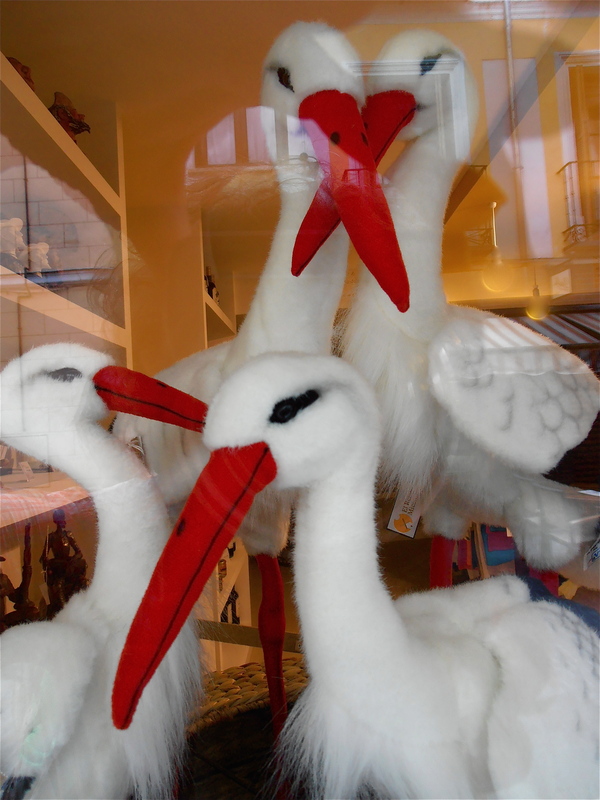 Like many of you, I grew up with stories about the Klapperstorch, which is what the White Stork is called in German. The German name, which translates as “clattering stork”, refers to the characteristic noise the bird makes with its beak during the mating season. 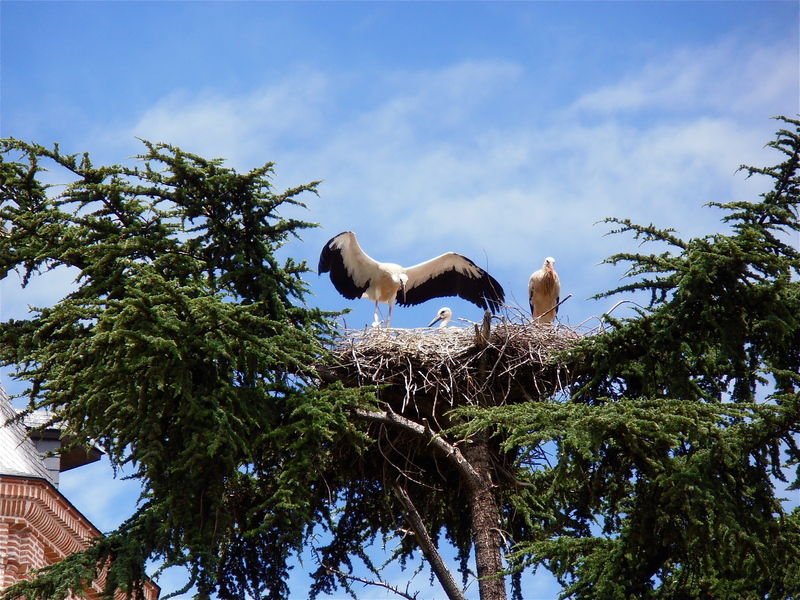 Now here’s an interesting factoid for you: storks are mute. The clattering sound is the only type of noise they can produce, as they don’t have a syrinx (voice box), which is what ‘normal’ birds use to trill and chirp you out of bed in the morning when you could really do with another couple of hours of shuteye. So, no annoying squawking, crowing or screeching out those stilt-legged creatures, which only adds to their serene mystique. 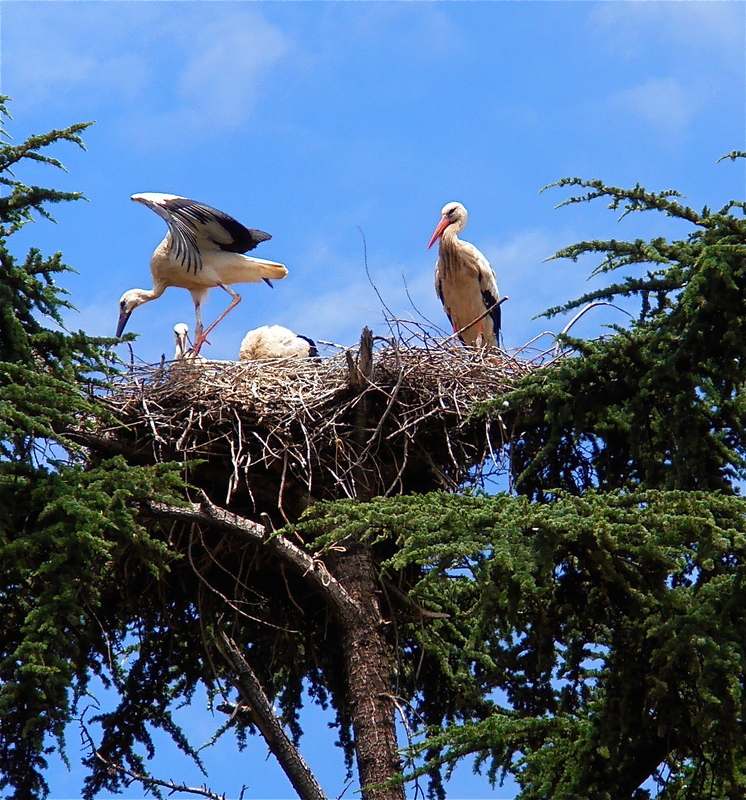 Apart from the beak rattling habit, storks are famous for their brightly coloured red legs, for blocking up chimneys with their armchair-sized nests, and, of course, for delivering babies. 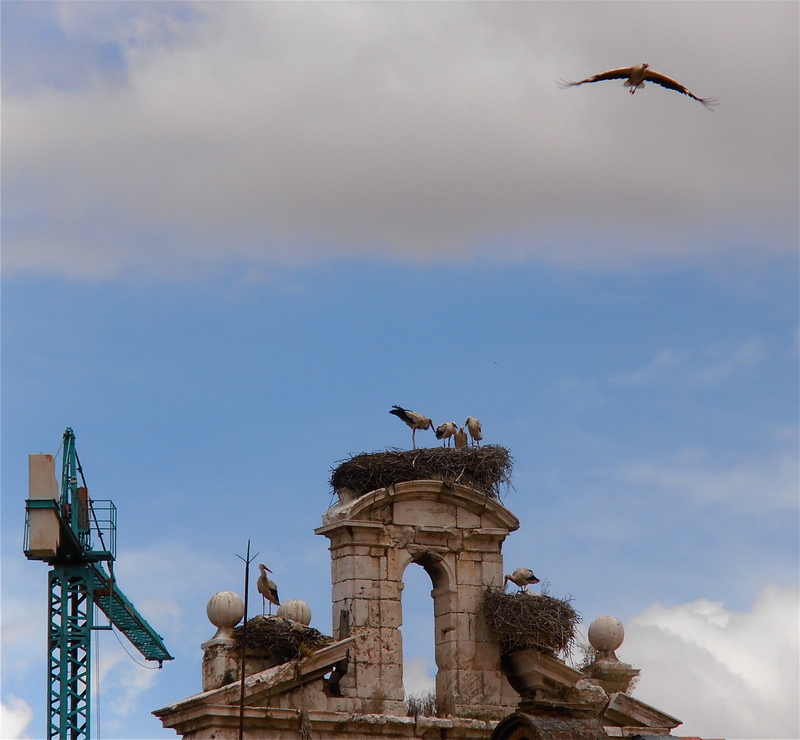 My friend Maria told me that in Spain, storks don’t just pick them up from any old place, oh no, they fly them in fresh from Paris. So, all Spaniards are, in fact, French. I’m glad we’ve cleared that up. 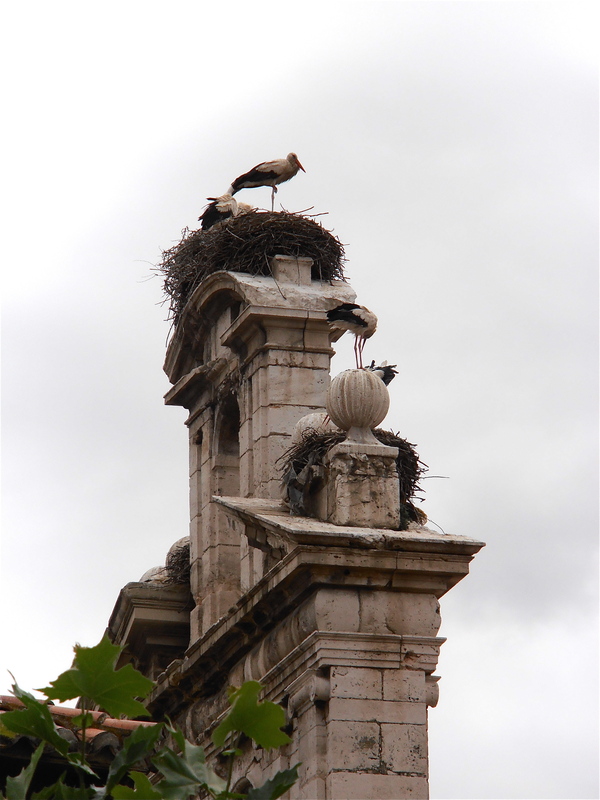 Although I’d heard a lot about storks, I’d never actually seen one in the flesh until I got to Spain. We have some in Toledo, but they are hard to find, you’ve got know where to look. 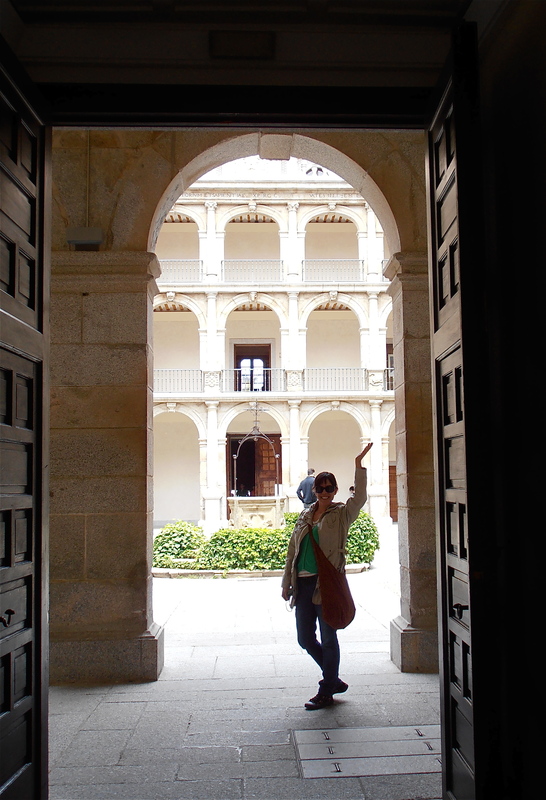 Not so in Alcalá de Henares, the town Maria and I visited earlier this week. 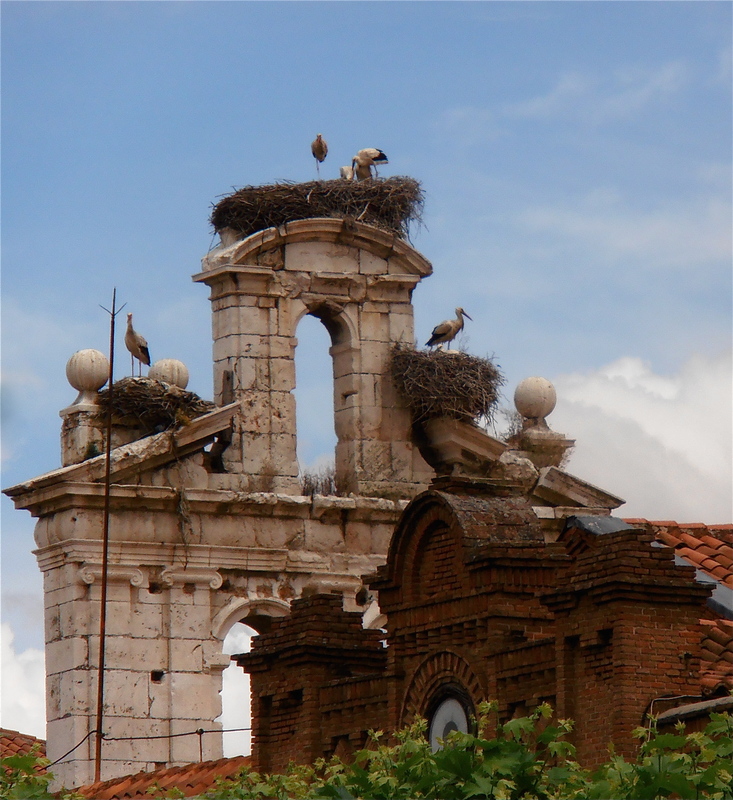 Those winged giants are everywhere, perched on rooftops, church spires, arches, trees… Alcalá is famous for harbouring more storks than any other Spanish town, owing to its conservation work which has greatly increased the number of breeding pairs. 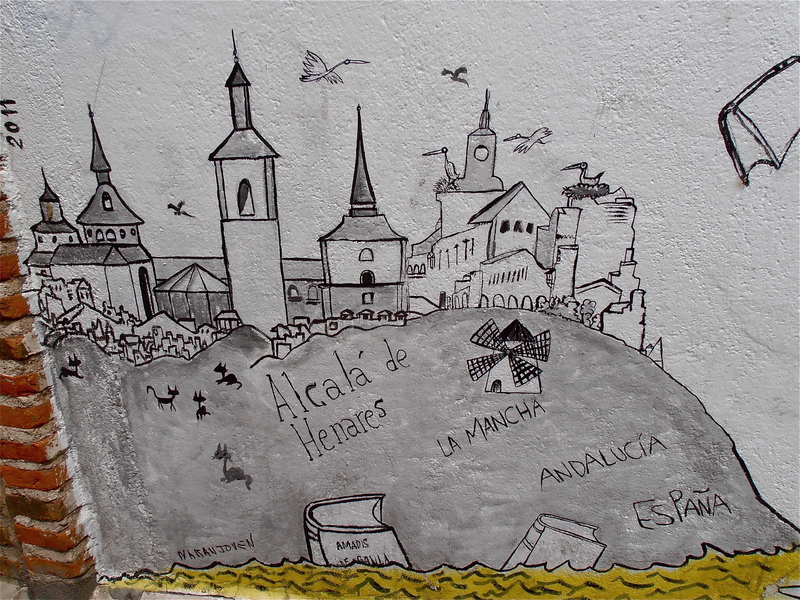 This entry was posted in Spain's Towns and Cities and tagged Álcala De Henares, Cultural Differences, Nature, Spanish customs, Spanish Towns on June 23, 2013 by ladyofthecakes. 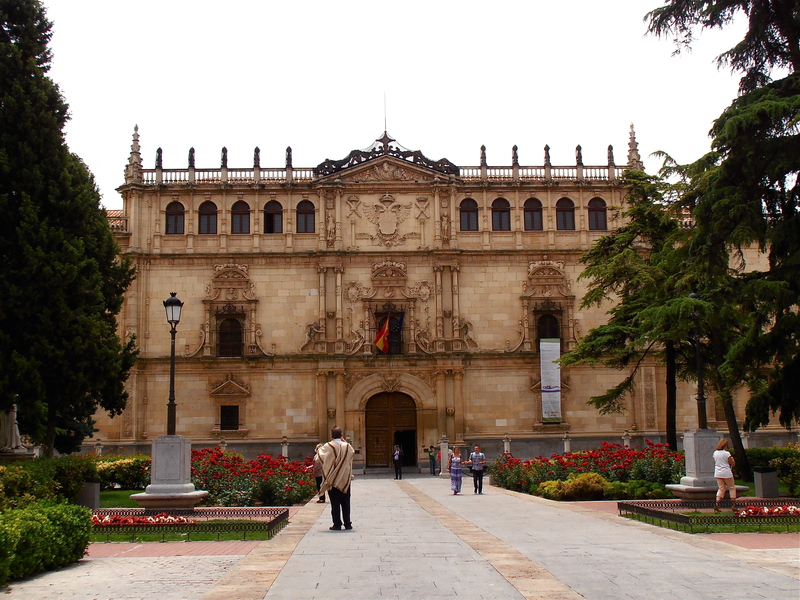 Those of you who read my Weekly Don Quixote post a couple of days ago will know that I absconded with my friend Maria to Alcalá de Henares earlier this week, a town located ca. 35km northeast of Madrid. Like Toledo, it’s a UNESCO World Heritage Site. Not quite as scenic and arresting as Toledo or Segovia, but still fairly respectable. Maria and I had a really good time, but one thing that will forever be etched into my memory about this visit is a rather unsatisfactory cake experience. After a morning’s wandering about and taking photos, we treated ourselves to a tasty sushi lunch. However, as is so often the case in Asian restaurants, the dessert choices left much to be desired, and so we decided to go elsewhere for coffee and cake. This should be easy enough… unless you’re in Spain. They do have nice cakes, but these tend to be sold in bakeries/patisseries not equipped with coffee machines or tables, and are strictly take-home only. 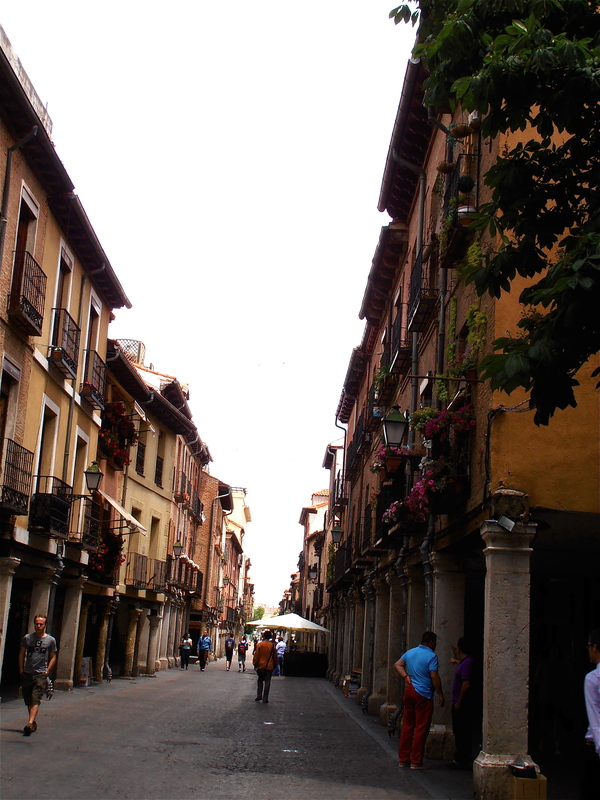 It was no different in Alcalá, where we’d been ogling sumptuous pastry creations in bakery windows all morning. Eventually, we spotted a place that seemed to offer the whole package: delectable cakes and a coffee frother inside, as well as tables and chairs outside. But, would you believe it, they were closed for lunch! (Many shops still follow traditional business hours, and this means a siesta-conducive marathon lunch break lasting from 2pm to 5pm). Maybe, just maybe, this is not the absolute smartest strategy if you’re in the business of selling coffee and cake, but seeing as there was no suggestion box, the owners may never cotton on to the revolutionary concept of giving people what they want when they are most likely to want it. Sigh. We tried the restaurant next door, asking if we could have a coffee and a dessert, but we were promptly told no. They were serving either a full lunch or nothing! Paradoxically, the place was flippin’ empty, and it was 3.30pm, which is the tail end of Spanish luncheon time. What famished last-minute hordes were they expecting to pile through the doors at this hour?! I’m constantly being told that “customer service is a lot worse in the South”. To be honest, I cannot imagine that. Nor do I want to. 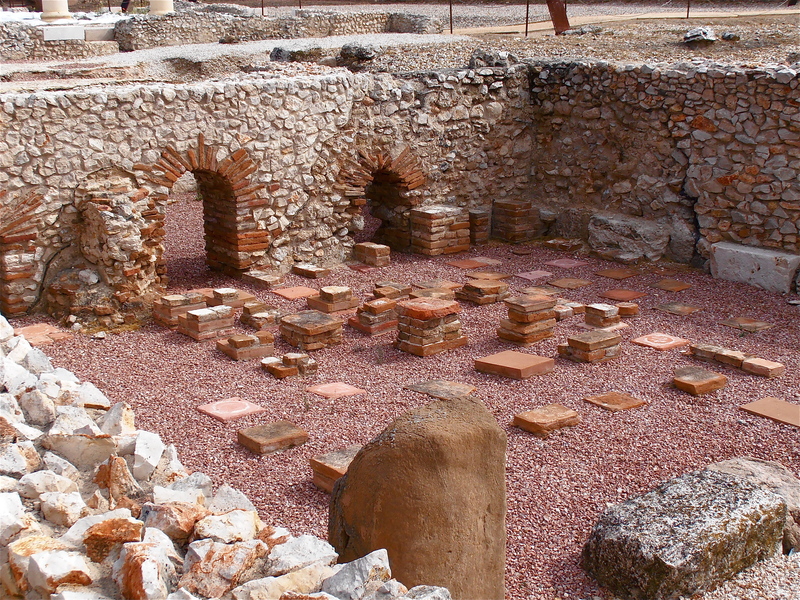 There was a large Roman settlement before Alcalá came into being. 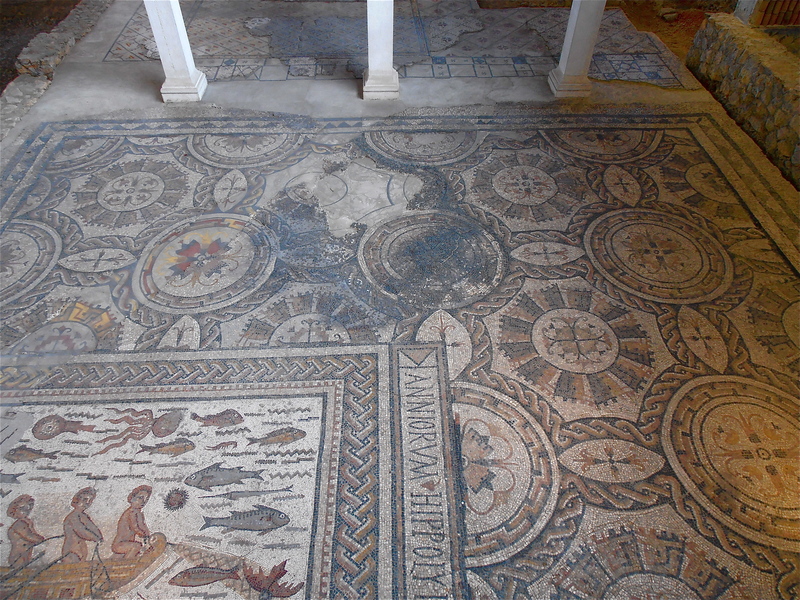 These remains were once part of a residential area. 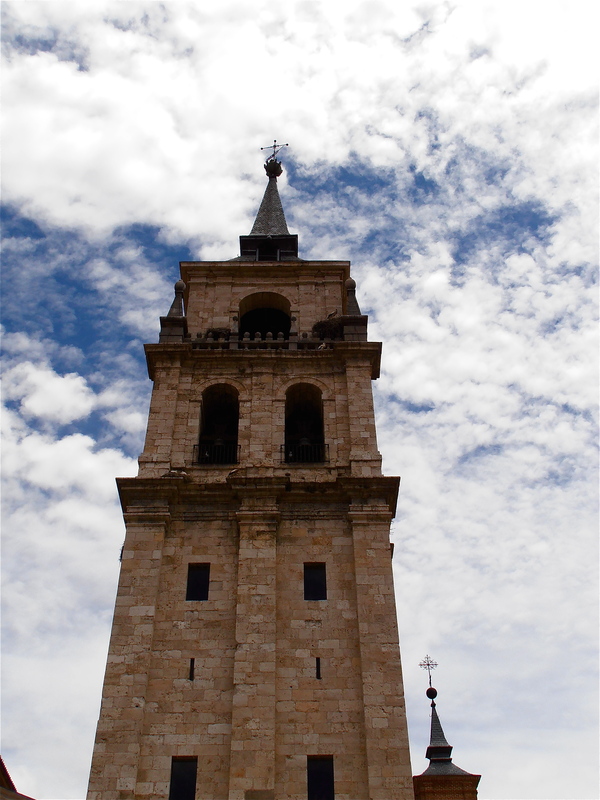 If you examine the Cathedral tower closely, you’ll see something that Alcalá is very famous for… more about that in my next post. 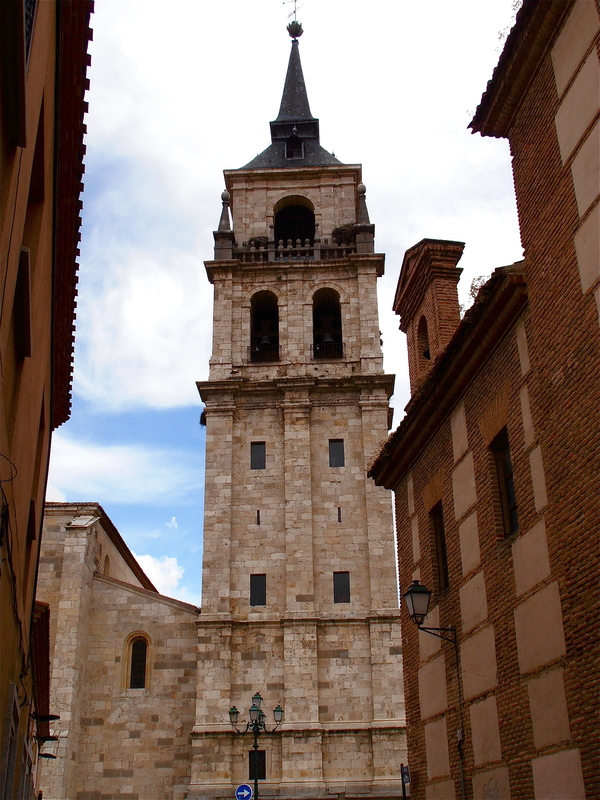 This entry was posted in Spain's Towns and Cities and tagged Álcala De Henares, Beautiful Buildings, Cultural Differences, Food culture, Living in Spain, Spanish customs, Spanish Towns on June 21, 2013 by ladyofthecakes. Yesterday was a very exciting day for me. 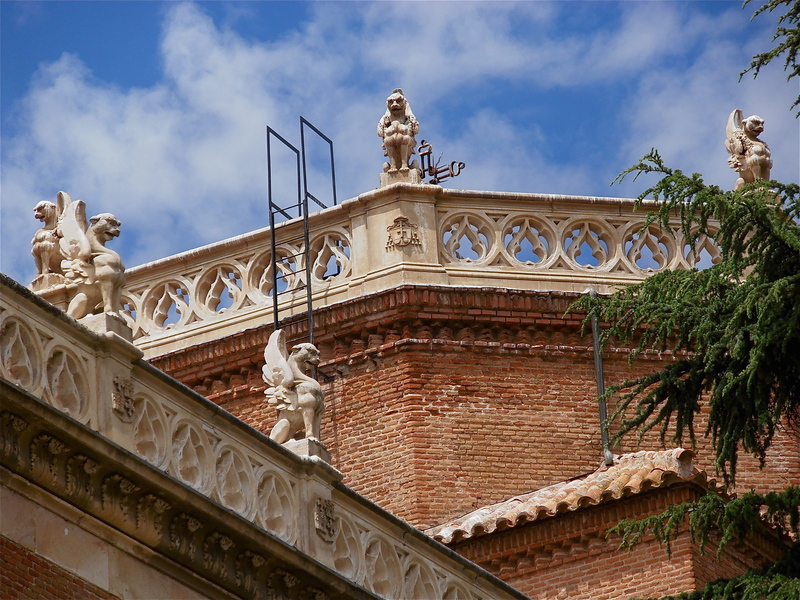 My friend Maria and I went to Alcalá de Henares where, as you may remember from the very first post in this series, Miguel De Cervantes was born. It’s about an hour’s drive from Toledo. And as you can imagine, the intrepid knight is as big a celebrity (if not bigger!) 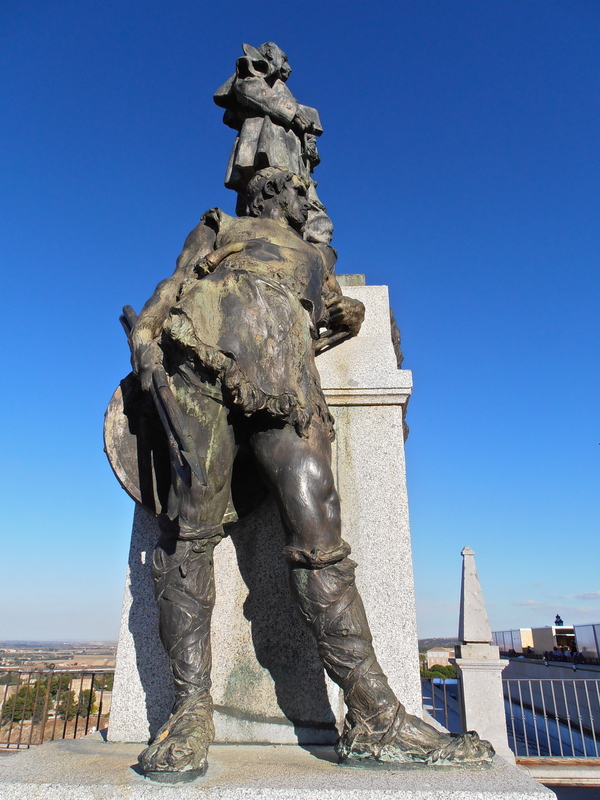 in Alcalá as he is in Toledo. The town is littered with statues of his genius creator. 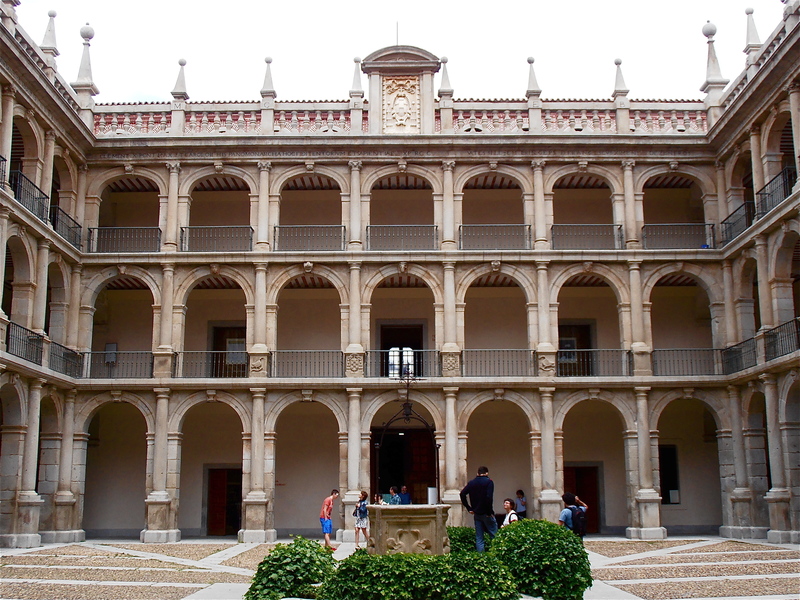 The house, where Cervantes was born, has been turned into a museum. Entry is free! And right outside the gate, I discovered, to my great delight, that DonQ and Sancho P. have taken up the national sport religiously practiced by all the country’s males in their mature years: congregating on public benches, gossipping and watching the world go by. How could I resist from joining them?!? I remain utterly star struck as I hit the “publish” button… it’ll take me a while to recover from this unexpected in-the-bronze encounter, I can tell you. 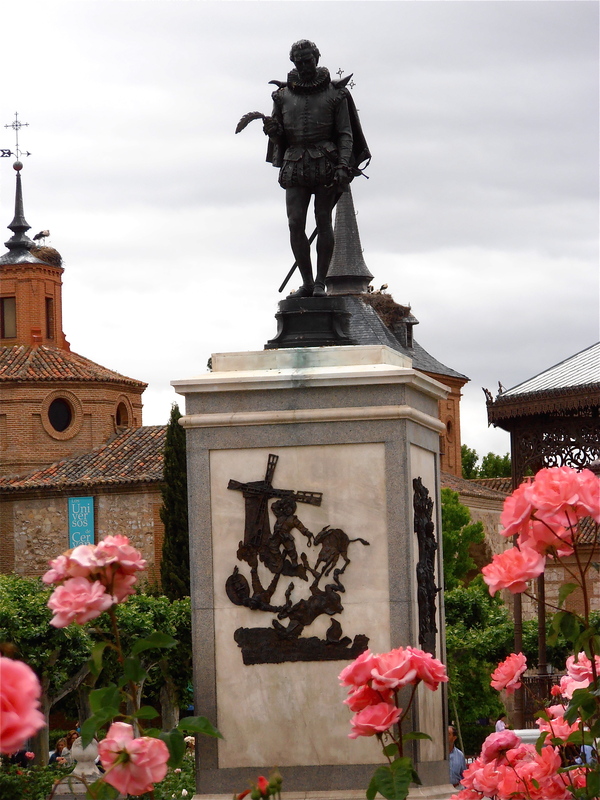 This entry was posted in Don Quixote and tagged Álcala De Henares, Don Quixote, Spanish Towns on June 19, 2013 by ladyofthecakes.